12Vdc powered 2 to 45 minute DELAYED-ON timer module with a mains rated relay output. The user-set delay time starts when power is applied to the board but the relay remains off. 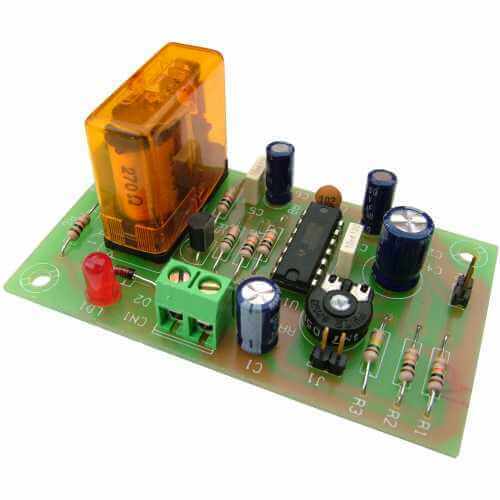 On completion, the relay activates and remains on until the modules power supply is removed. The process will be repeated each time the board is powered up. The timer can be modified to activate using the Start Input (using for example a push button or relay contact closure). The timing sequence is non-retriggerable and will be completed regardless of further trigger signals or if the contacts remain closed after activation. Power must be removed and reapplied to reset the timer.